The Swhetty Betties group thought we'd have a little fun. Each designer paired up with another. One designer provided a pattern. The other sewed the item and paired it with a pattern of her own. I was lucky to have Rachel Rossi as my partner. As soon as I saw her "Squared Fashion Wrap", I could not wait to get started. I decided her wrap and my Tracie skirt were meant to be together. 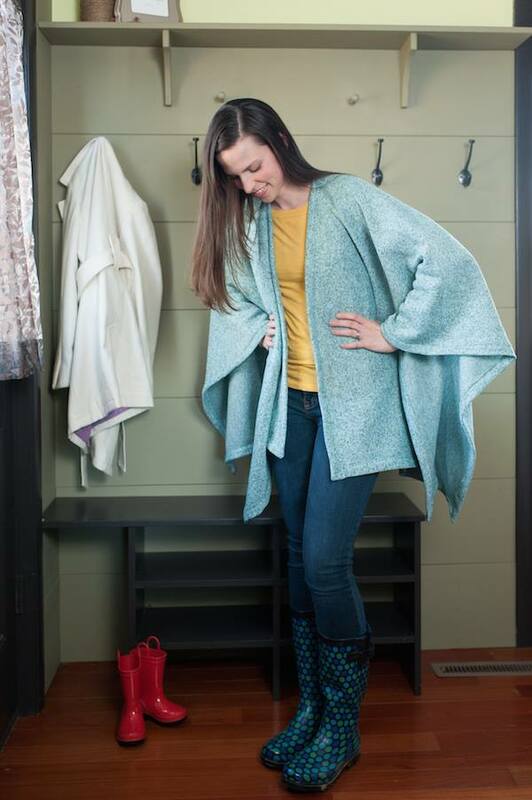 I read the description on her website and absolutely agree "It’s lovely, it’s cozy, it’s soft—perfect for a chilly day at work or even an extra layer outside when the weather gets a bit warmer. The Squared Fashion Wrap is all of these things. With an array of fabric options and a user-friendly, simple pattern, you’ll be able to create an array of these wraps for every season!" I could imagine making this in fleece to wear to my son's hockey games. I might even cut up a blanket, you just never know. It takes just 1 2/3 yards of fabric either 45" or 60" wide. 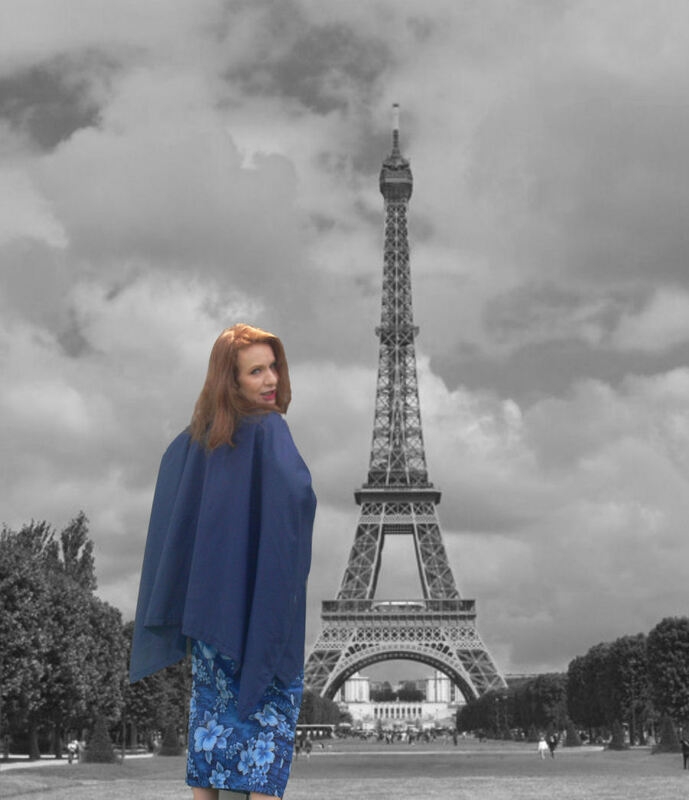 I knew that the Squared Fashion Wrap was so much more than a cold weather friend. Organza, lace, flannel, cotton, gauze, satin and voile all yelled, "Pick me!". I was so excited about this pattern that I mentioned it to one of my testers. She was all over it. She asked if she could participate. Naturally, I needed Rachel's permission since the pattern was not mine to share. Rachel agreed and Patricia was the next to fall in love with the wrap. Did you ever buy or make a dress that you wish had sleeves? Have you ever wanted an extra layer just because? This pattern is incredibly versatile. I think it would be just as great in flannel over a pair of jeans as it would be in satin over an evening gown. How about that teacher gift you need now? What about that friend who really does have everything? How about using terry to make a bathing suit cover up? Oh, the mitered corners! Yes, please. What a beautiful finish. The Squared Fashion Wrap pattern is rated as beginner and I believe that is accurate. You really just need to be able to sew a straight seam and you do not need any special equipment. I am 5' 6" and used 60" wide fabric for the blue wrap. The white one is made from 45" wide fabric. Both are fine for my height. I think the width you choose depends on the coverage you want and possibly your height. My son is 6' tall and the 45" wide wrap ended just above his waist. I promised him no photos would appear on the blog. Darn. You can make the wrap in one sitting. It's as simple as press, cut, sew. Best of all, no pages to tape together. I'm serious.That is a huge time saver! The Tracie skirt has a knee-length and a floor length hemline. This is a high-waist skirt that sits at the natural waist. You see the maxi version in the photo above and below. 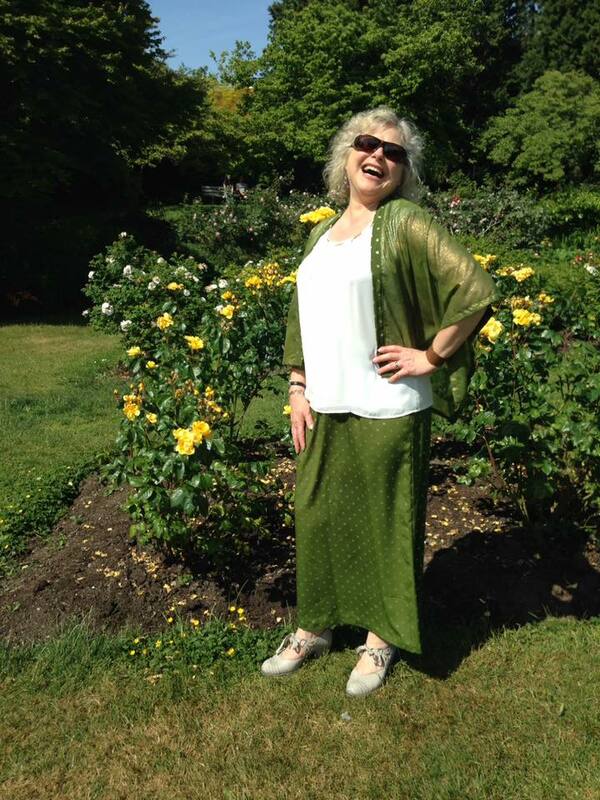 This is the knee-length Tracie with the Fashion Squared Wrap in 45" width fabric. 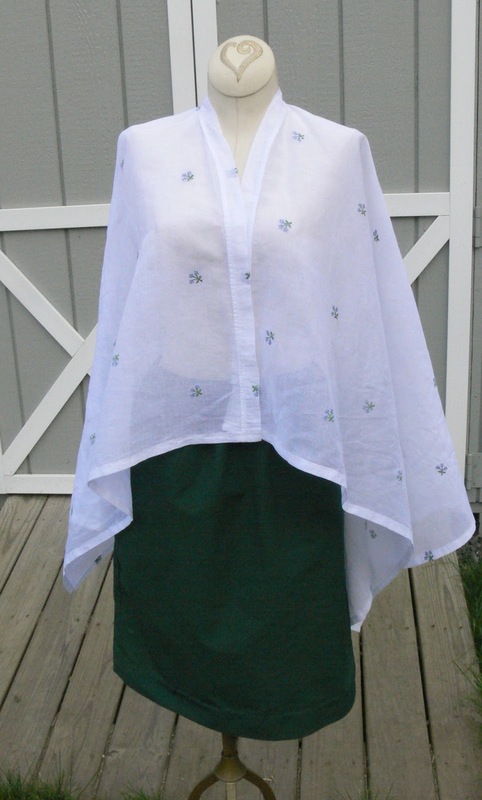 The white wrap is made with a gorgeous sheer embroidered cotton I happen to have on hand. The knee length skirt is made from poplin. I can see the same skirt with a flannel wrap for cool weather. It's always nice to get more than one season out of something you've made. I drafted the Tracie skirt to be a very quick sew. This is an "I need it for tomorrow" skirt. You may choose between knee or maxi length. A lengthen/shorten line is provided so that you can further customize your length. Inseam pockets and a lining are optional. The waist is elastic. You could easily make the skirt in one day. 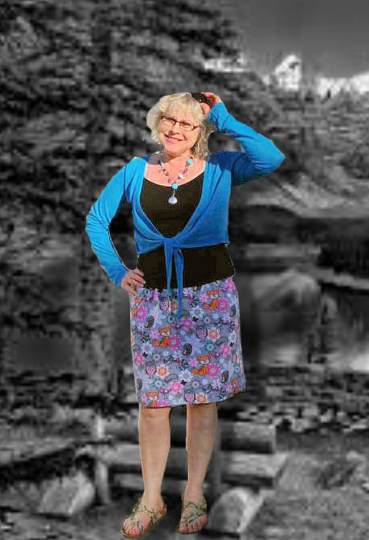 If you're a beginner in a hurry, you might make the skirt with the lining but skip the pockets. As with most of my patterns, Tracie supports layers so you can print just the size or sizes you wish. Please follow Designer Pairs this week and stay for the final giveaway. You will have a chance to win a copy of each of the patterns featured during this promotion. I adore the Tracie Skirt! It was a super quick and easy to sew up,thanks to the structured explanation by Frances Twining. I made one and could not resist making a second.